Besides the traditional bamboo tattooing, there are a lot of places which are also using the electric gun tattoo. 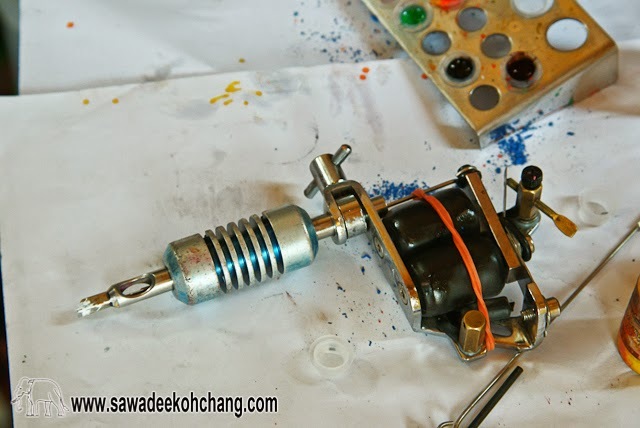 From the north to the south of Koh Chang you will see a lot of tattooing studios. 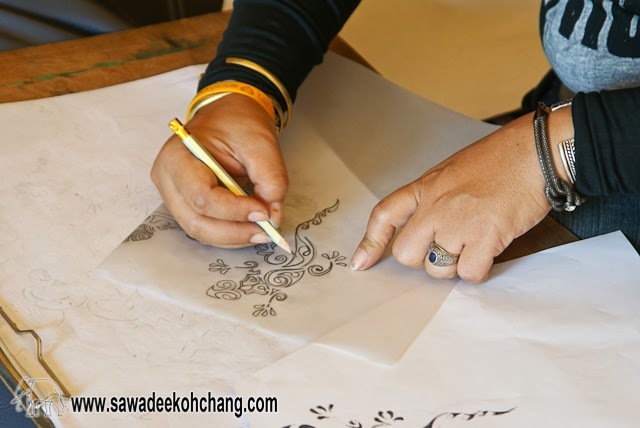 Prices are relatively cheaper than what you can find in the Sates or in Europe, a bit more expensive than in Bangkok, and the quality will depend of the skills of the tattooist of course. 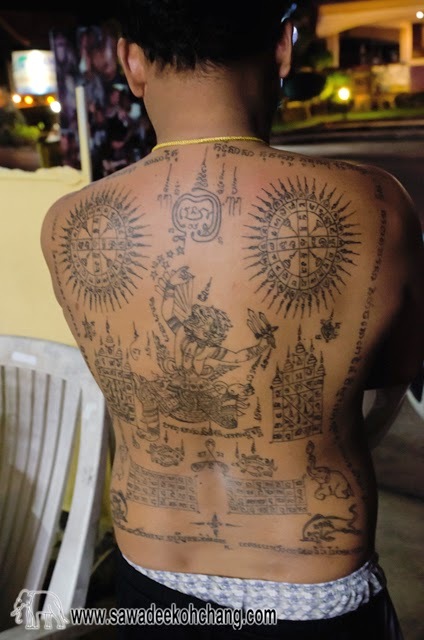 If you are tempted by getting inked, why not to try the Thai traditional way? If you have never done it before you may wonder what are the differences between bamboo and machine tattooing. Bamboo tattooing is much slower than machine tattooing, it can be 2 times or more longer depending of the design of course. It's more painful with bamboo but the skin is just puncture and not torn which means that there is no scabbing and because of that the skin is not bleeding and it's healing faster. With bamboo tattooing the colours are more vibrant and stay bright longer. If after all of that you still want to get tattooed, there are few things which need to be checked. Be sure that the studio is clean. Most of the tattooist don't have air-conditioning and are just using fans. This means that people who have been tattooed before have been sweating. 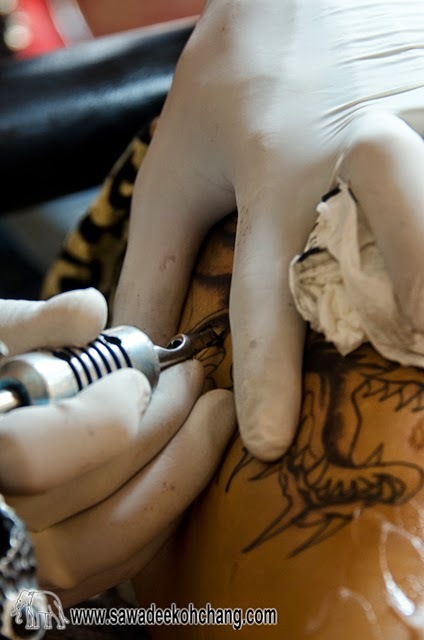 A dirty place and getting tattooed right on the floor could bring you bad infections. Check that they are using brand new sterilized needles and proper tattooing ink. Most of tattooist are wearing sterilised gloves but it's mainly to protect them from the ink. In Bamboo tattooing, the rubber is cut for the thumb otherwise the bamboo would slide. If you have old tattoos which needs to be re-coloured or covered, it's all the time possible. And finally if you are attracted by tattoos but don't want to have it all your life, why not getting a henna tattoo? The henna paste is made from a plant. It's painless and will last few weeks depending of your skin. I strongly recommend you Naka Tattoo Studio, King Tattoo, Danny Tattoo and Traditional bamboo tattoo by King. - Coffee from Naka Tattoo Studio is located in White Sand beach. She has been studying art and been graduated before her several years of experience in tattooing. 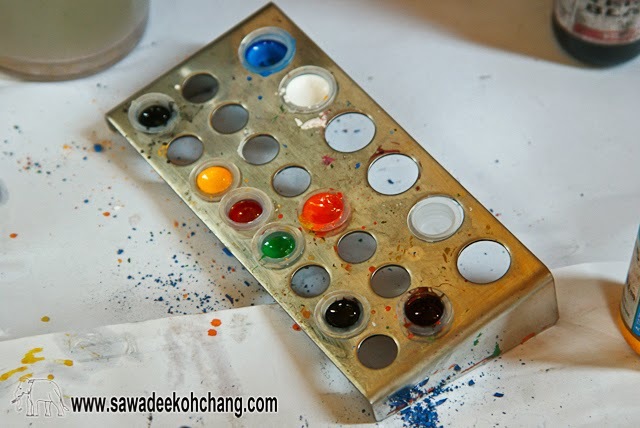 - King has his studio in Klong Prao, nearby Koh Chang Gym and his opened all the year. - Danny who is located in Lonely beach is a real artist. Getting a time during the high season may be difficult, you need to be patient or to contact him early enough. - The second King is located in Bang Bao. 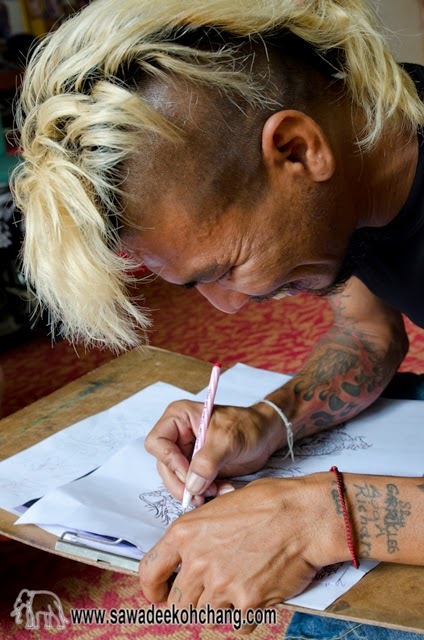 He is an expert in traditional Thai bamboo tattooing. Also opened all the year and very friendly like that other one mentioned above. On top of that they are all very friendly and for sure you will end to become their friends.